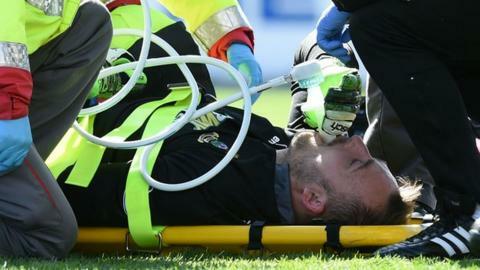 Inverness Caledonian Thistle manager John Hughes confirmed goalkeeper Dean Brill had suffered a dislocated knee in the 1-1 draw with Celtic. Brill, who had just returned from an 11-week absence, was stretchered off after making a clearance in the first half. The 29-year-old is likely to miss next week's Scottish Cup semi-final against Celtic at Hampden. "I really feel for Dean," said Hughes. "Hopefully he gets a speedy recovery." Esson, who has deputised in recent weeks, came on for Brill and saved well from headers by Efe Ambrose and Jason Denayer at the Caledonian Stadium. "I saw how hard he [Brill] was working, in rehab and training really well, possibly with that semi-final in mind," Hughes told BBC Scotland. "We're fortunate that we've got a number two and a goalkeeper coach [Esson] that can play his part. He's had good game time. It [the semi-final] won't phase him." Edward Ofere cancelled out Leigh Griffiths' opener for Celtic with both goals coming in the opening five minutes. "They showed a spirit to come back," said Hughes. "We matched Celtic in the first half. "In the second half, we sat too deep. It was all Celtic and we got a little bit lucky. We had one or two efforts at goal. "In terms of effort and commitment, I cannot fault them. "I'm trying to guide them and educate them. When you're under the cosh, if you keep giving the ball away against a good side like Celtic then, inevitably, the door's going to open. We need to be better on the ball. "If they turn up on the day and go for it [in next week's semi-final], they're capable of taking you for a good three or four. We need to have a belief that that's not going to happen. We need to be solid, resolute. We need to be good on the ball." "We couldn't be quick enough on the ball so we didn't create the chances we wanted," he explained. "In the end, we got a point and that's better than nothing. We look at our performance and that was a step down if you compare to what we had done lately. "We looked a little bit tired today. "We're going to have a tough semi-final but we know that we have a good chance."